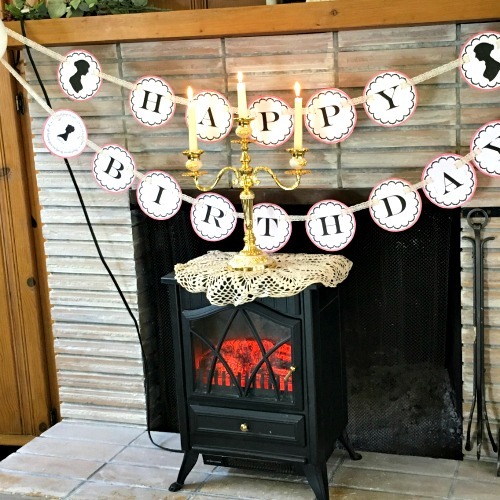 A Jane Austen birthday party is a fun theme for older girls. 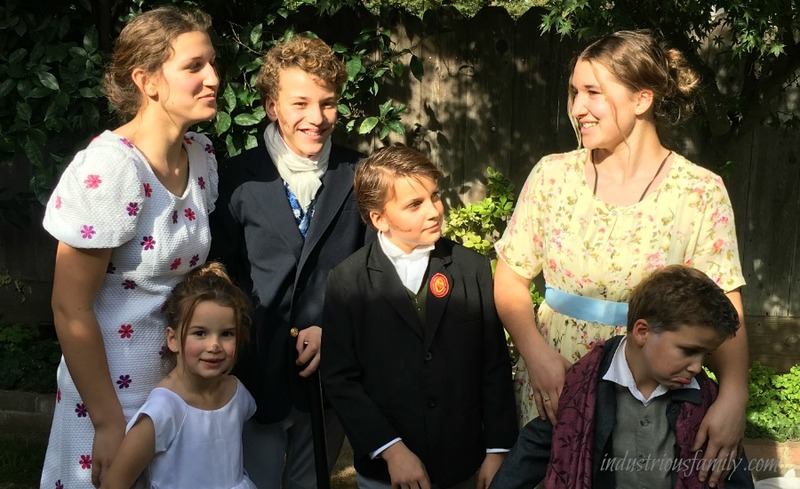 With the regency era gowns and up dos, this is not just a costume party...it's an event! Jane Austen novels are found on nearly all young women's book shelves. The movies are a joy to watch, and young ladies love analyzing the characters and thinking about whom they are most like. As girls mature and begin to experience society outside their own homes, the stories take on more meaning and become even more enjoyable as no one can capture the intimate relationships between neighbors and human nature in general the way Jane Austen can. Our favorite Jane Austen movies are the BBC version of Pride and Prejudice. There is way too much cleavage but Colin Firth is the best Mr. Darcy ever and the movie is almost word for word to the book. BBC's version of Emma (2007) is our favorite Emma. It is such a lovely movie. The clothes and music are amazing! We also enjoy Sense and Sensibility staring Emma Thompson and Hugh Grant. Emma Thompson wrote the screenplay and she did an amazing job. Before throwing your party or you are invited to a Jane Austen birthday party you may want to watch these three movies to get you in the mood and get your costume ideas flowing. This party is especially fun because it is a costume party! Have your guests wear dresses similar to their favorite characters. 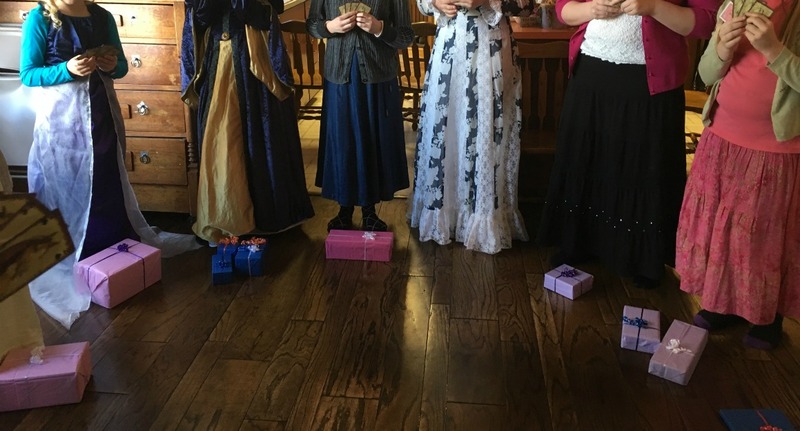 We've enjoyed dressing as Elinor from Sense And Sensibility; Emma and Harriette Smith from Emma; and Elizabeth Bennet, Mrs. Bennet, and Lady Catherine Debourgh from Pride and Prejudice. The boys are always good sports and got in on the fun dressing as Mr. Darcy, Mr. Knightly, and Mr. Woodhouse, Emma's father. The dad in this household loves woodworking and viewed making canes for the boys as a fun way he could contribute to the party. There was only one occasion of fencing with the canes, which looking back, is also period appropriate. Black busts and candelabras are very recognizable Regency era paraphernalia. 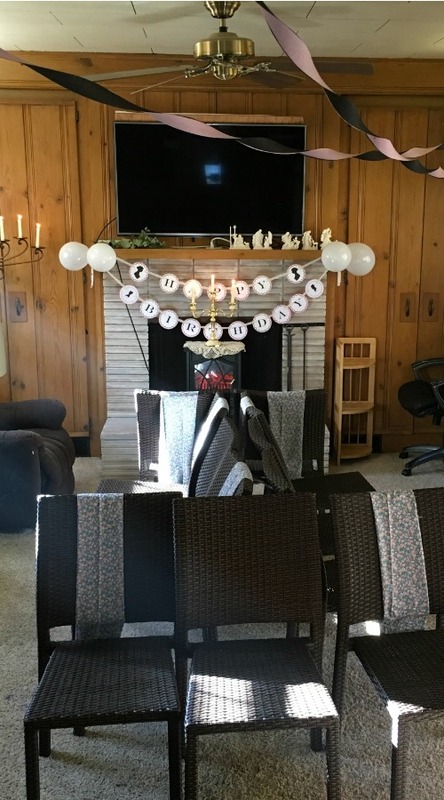 Incorporating them and making black part of the color scheme is a simple and affordable way to make this party feel very elegant. Lace and lace doilies spread under the food is also a nice touch. The tea cups themselves lend to the overall feel of this party. If time and space allows, quotes from your favorite Jane Austen novels adds a very special touch. Print these quotes out on white paper and mount them on black paper. 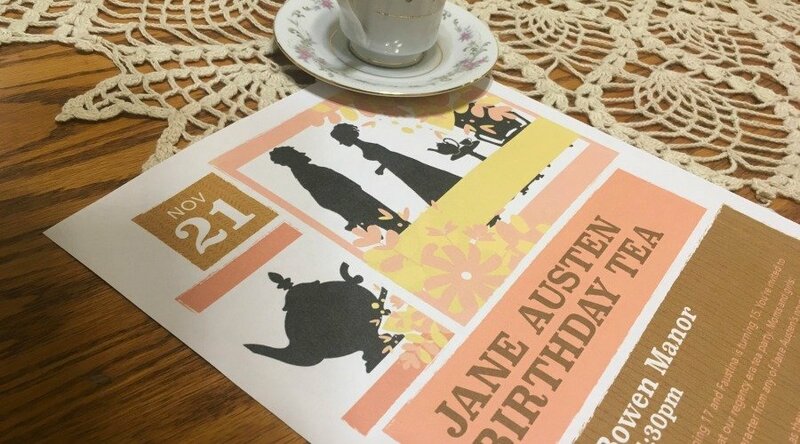 This Jane Austen Birthday Party banner was printed from Shower of Roses' blog. Some very inspiring ideas can be found in that blog post which include a link to download and print your own banner. On to the food: A cake that tastes delicious with tea is our adaption to All Day I Dream about Food's coconut lemon curd cake. That served with fruit, vanilla ice-cream and tea is perfect for your Jane Austen birthday party. You can serve this cake whether the occasion is a birthday or not. Some cheese and salami is always a welcome treat served as guests arrive. Save the cake for after the games and when tea is served. Any games that are appropriate for tea parties work well for a Jane Austen birthday party. Musical chairs to music from the movie Emma and the tea bag toss are musts. Some sort of trivia game is nice as an ice breaker too. All these games are explained on our tea party page. An alternative to a trivia game is Would You Rather? To play this fun ice breaker, you'll need a large container and a few notes that have some comparisons on them. "Would you rather travel the world for free or live anywhere for free?" and many other tough comparisons. Pass the container with all the cards in it around the circle, and have everyone draw a card. Once the container has gone around, the first person in the circle reads their card and tells everyone what they would rather. Let open discussion ensue before moving on to the next person. For girls who insist upon giggling, this miscellaneous utensil game is fun. All you really need is the things that every kitchen has: serving utensils! Oh, yes, and ice-cream. Any other awkward serving utensil will do the trick! Number all the utensils for as many teens as you are expecting. Put the same numbers in a bowl and have the young ladies draw the numbers. Whatever the number is she must eat her ice cream with the utensil that matches the number. This game is best for a group of tween and teenage girls. Don't try to do all these games, two or three is a good amount. Another good combo for a mellow party is a white elephant exchange and the tea trivia. A gift for as many people as are attending, already gift wrapped in colors or patterns matching your theme. Make these gifts as attractive as possible. Have all the gifts on a table for all to see. Stand in a circle in the middle of the room, leaving space in the middle. Take one deck of cards and deal them all out. (any leftover cards can be taken out, but they must be taken out of the other deck as well). Taking your other deck, read the first card. The person that has that card can go grab a gift and set it in a pile at her feet. Repeat until all the gifts are off the table. Now the everyone can start taking gifts from each other's piles. When all the deck has been gone through, the remaining gifts in your pile is yours. Warning: This may insight giggles as well. I hope this is the theme you will choose for your next party. We always have such a blast! A Jane Austen Birthday Party is a lot of fun and Bee-Jay and I had the time of our lives at the two parties we've been to.